Treatment planning tools that use biologically related models for plan optimization and/or eval- uation are being introduced for clinical use. A variety of dose response models and quantities along with a series of organ-specific model parameters are included in these tools. However, due to various limitations, such as the limitations of models and available model parameters, the incomplete understanding of dose responses, and the inadequate clinical data, the use of a bio- logically based treatment planning system (BBTPS) represents a paradigm shift and can be potentially dangerous. There will be a steep learning curve for most planners. The purpose of this task group (TG) is to address some of these relevant issues before the use of BBTPS becomes widely spread. 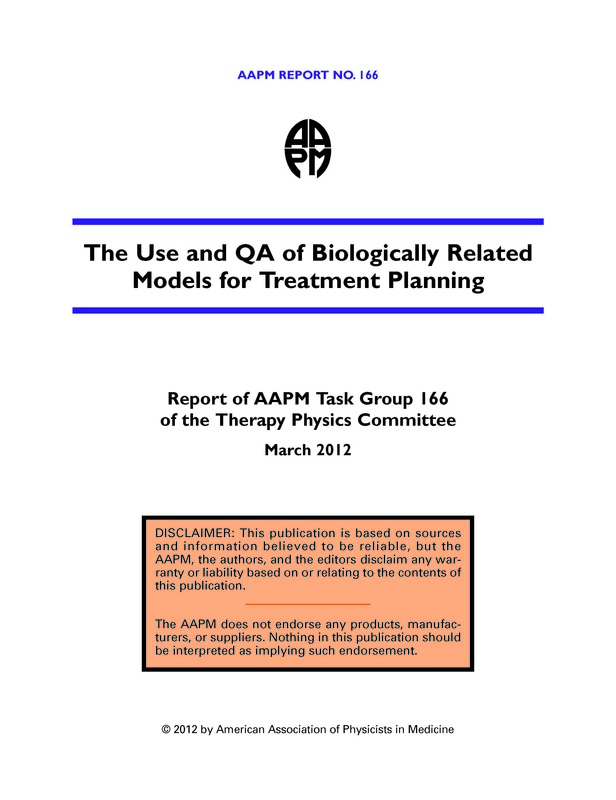 In this report, we (1) review the biologically related models including both used and potentially to be used in treatment planning process; (2) discuss strategies, limi- tations, conditions, and cautions for using biologically based models and parameters in clinical treatment planning; (3) demonstrate the practical use of the three commercially available BBTPSs and potential dosimetric differences between biologically model–based and dose- volume (DV)–based treatment plan optimization and evaluation; (4) identify the desirable features and future directions in developing BBTPS; and (5) provide general guidelines and methodology for the acceptance testing, commissioning, and routine quality assurance (QA) of BBTPS. A Short Report was published in Medical Physics Journal (see below).